Are you looking for the best WordPress themes for your travel blog? If you love traveling and having adventures, you can create a travel blog, share your stories, become popular, and earn money from your writing. Similarly, if you’re a travel business owner, creating a travel site is a must for growing your business. 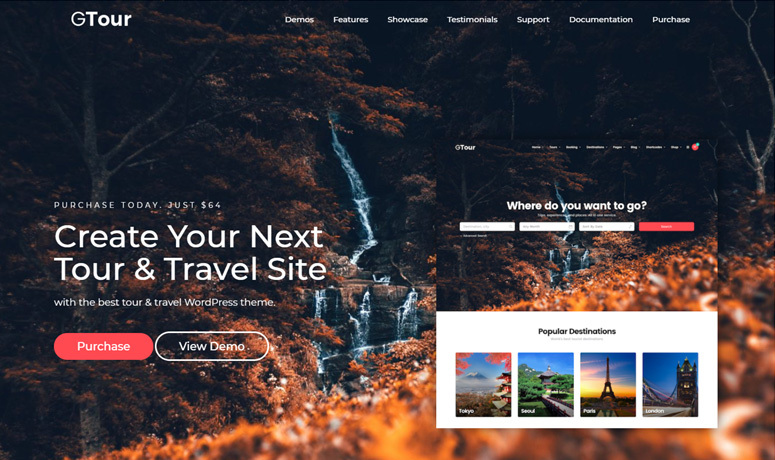 In this article, we’ll share the best WordPress themes for travel blogs and websites in 2019. It’s a handpicked list of travel themes chosen by experts so you can feel confident picking any theme featured to start your travel website. WordPress is the most popular blogging platforms and website builders on the market today. 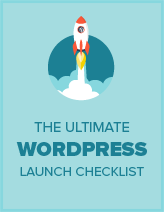 Millions of websites, including world’s top brands, are using WordPress to create their websites and blogs. To create a travel blog in WordPress, you’ll need a domain name and a hosting account along with the WordPress software. A domain name is your website’s address (URL) on the web, like Google.com or IsItWP.com; and web hosting is where your website’s content and files are stored online. You should check out our article on how to choose the blog hosting. A domain name usually costs $14.99 per year and a hosting plan costs $7.99 per month. Hence, the combined cost of domain name and hosting can be really high at the beginning, especially if you’re planning to start with a low budget. Thankfully, you don’t need to worry about that anymore because Bluehost is offering an exclusive offer to IsItWP users. Now you can get WordPress hosting for just $2.75 per month (60% off on the regular price) and a free domain from Bluehost. Plus, you’ll also get a free SSL certificate to secure your domain. After purchasing your web hosting and domain name, you can start building your travel blog or website by following our step-by-step guide on how to make a WordPress blog. 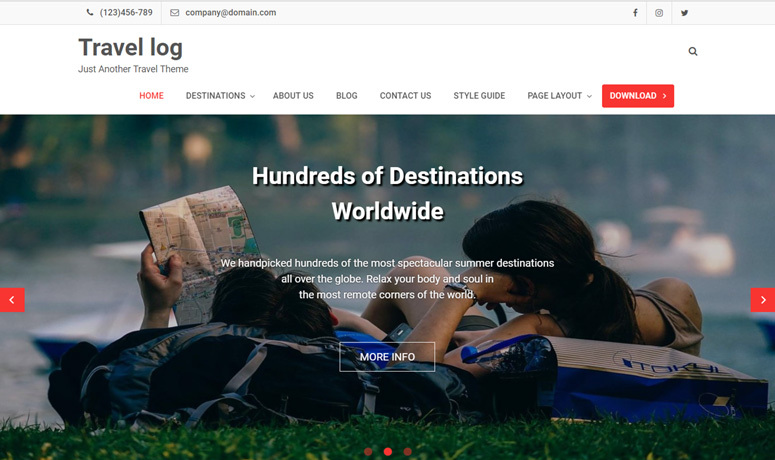 Having said that, let’s check out the best WordPress themes for travel blogs you can use on your travel blog or website. 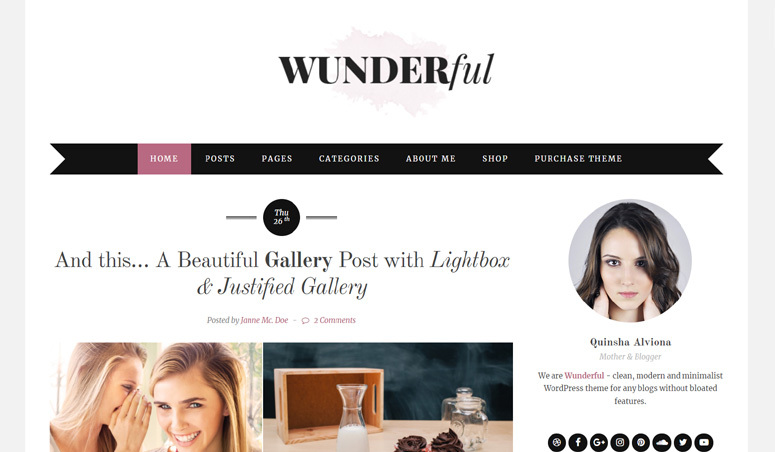 Wunderful is a clean and minimal WordPress theme suitable for creating a stunning travel blog. It has a wonderful blog homepage layout that suits all types of photo-focused blogs like travel, fashion, personal blog, food and recipe, etc. Plus, it has 2 new blog layouts, grid and list, for making your blog look professional. It’s simple and user-friendly with a select set of useful features, making it free from excess bloat. To let you configure and customize the theme, it has a built-in theme options panel. From there, you can customize unlimited accent colors, upload your logo and favicon, use Google fonts, and much more. The Wunderful theme is WooCommerce-ready theme, so you can easily add a shop page. Plus, it has social sharing options, gallery options, custom widgets, sidebars, and child theme support. Thus, you can easily create any type of blog using this theme. Read our complete Wunderful review. Get started with Wunderful today! Explorable is a great theme for explorers and is best-suited for creating travel blogs, travel guides, local business directories, and more. It’s a location-based WordPress theme which allows you to create listings on a map using an inbuilt custom post type, Listings. The theme assigns each listing a physical location on the world map using the Google Maps API. 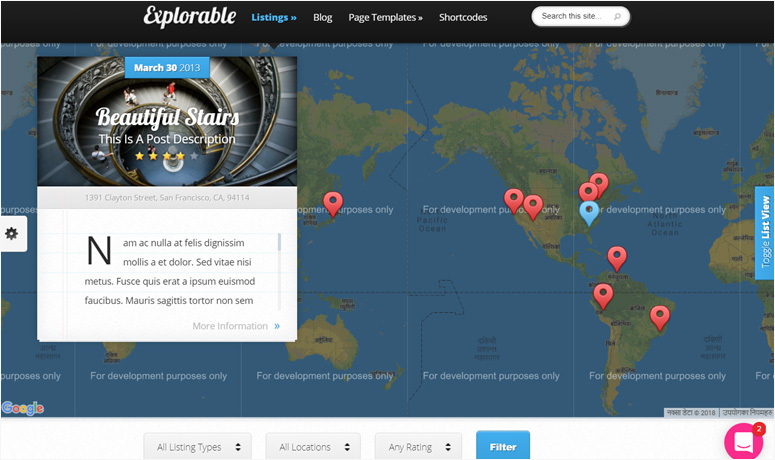 With Explorable, you can allow your visitors to rate each location on your map. It’s useful for local business listings as well as travel agency websites. You can also add author ratings to each location while creating the listing post. Additionally, it has a filterable listings search option to make browsing easy. There’re tons of page templates available in the theme like the blog page, gallery page, search page, portfolio page, etc. Each template comes with several styles and functions. It also features unlimited colors, shortcodes, and unparalleled support. Read our complete Explorable review. Get started with Explorable today! 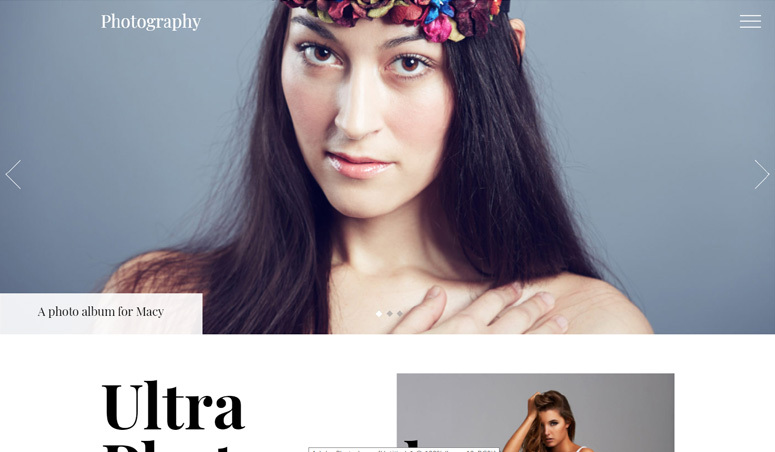 Themify Infinite is a full-page style blog theme with infinite scrolling. It allows you to add full-width images on blog posts that’ll make your blog look stunning. The infinite scrolling feature adds to the charm of your blog as it loads content infinitely as users scroll down the page. In addition to infinite scrolling, it features a sticky header, banner ad spots, slide-out widgets, WooCommerce support, etc. to make your blog beautiful as well as powerful. To let you customize the design, it comes with a user-friendly drag and drop page builder. So, you can create any kind of layout with live previews on the frontend. The Themify Infinite theme offers infinite possibilities for creating a blog. 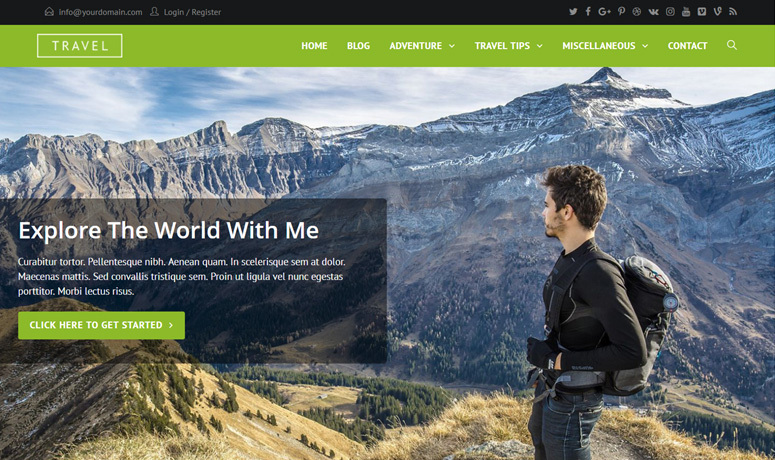 You can create a full-featured and marvelous travel blog easily using this theme. Read our complete Themify Infinite review. Get started with Themify Infinite today! 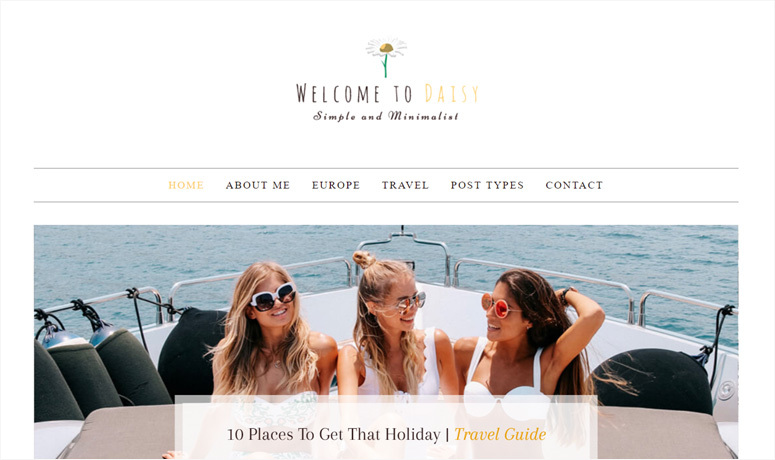 Daisy is a beautiful and elegant WordPress blog theme suitable for travel blogs as well as personal blogs. You can share your travel stories and exciting diaries with beautiful photographs using this theme. It has a fully responsive layout which makes your blog look great on all types of devices and screens. The Daisy theme comes with several blog layouts and sidebar options, multiple header styles, multiple post formats, etc. to let you create a blog with a unique style. It also supports 600+ Google fonts, social media icons, contact form plugins, and almost every WordPress plugin on the market. The theme also lets you import the theme demo content in your WordPress site with 1 click. This is useful for beginners who find it hard to build a site from scratch. Read our complete Daisy review. Get started with Daisy today! Themify Peak is a masonry style WordPress theme suitable for blogs, portfolios, magazines, and photography sites. The theme shows your posts in a grid design that adapts well to any screen size or device. You can choose the auto tiles option to let the theme automatically generate the masonry grid or set a custom tile size for each category. The theme features an optional mega menu, various post layouts, slide-out widgets, portfolio post type, WooCommerce support, and much more. It has a 1-click demo import option and ready-to-import demos in different skins. Therefore you can choose a skin, install it on your site, and quick-start your blog. Themify Peak theme comes with the powerful Themify Builder page builder plugin that helps you to create any type of layout without having to touch a single line of code. It allows you to customize almost everything by simply dragging and dropping and with real-time live previews. Read our complete Themify Peak review. Get started with Themify Peak today! 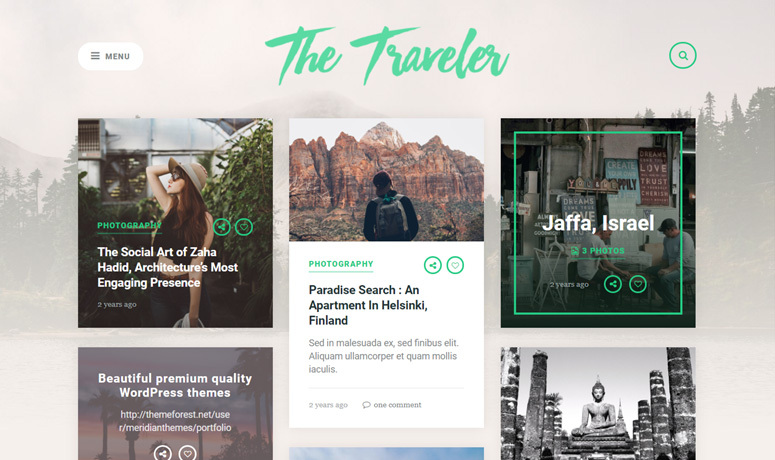 Traveler is a beautiful WordPress blog theme for travel bloggers, photographers, and storytellers. It comes with a simple and elegant grid-style blog layout to showcase your photos and content in an eye-catching manner. The theme comes with an in-built Instagram feed display option to display your latest Instagram photos in the footer and sidebars. If you love sharing your travel photos on Instagram, this feature lets you connect your Instagram with your WordPress blog and display your photos. Traveler theme uses the native WordPress Customizer to let you design your blog easily. You don’t need to use a single line of code to customize the theme options. And, you’ll see everything you changed in the real-time. Get started with The Traveler today! CityLogic is a free multipurpose WordPress theme suitable for travel, business, blog, and online portfolio sites. The theme features a transparent header for an elegant look. It also has an option to add a static image or an image slider on the homepage. You can use the in-built theme slider or any third-party slider plugin to add an image slider. 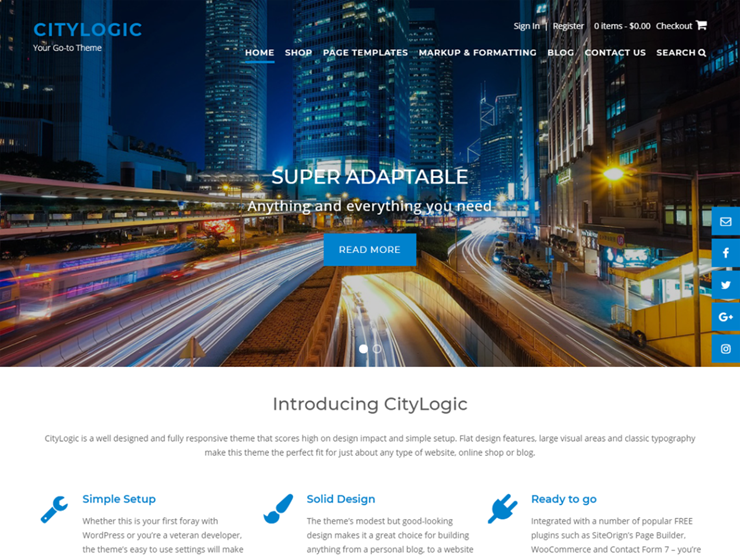 The CityLogic theme works well with popular plugins like WPForms, WooCommerce, and Elementor as well as SiteOrigin’s Page Builder. You can install either Elementor or SiteOrigin’s Page Builder and design your site using their drag and drop page builder options. There’re multiple page templates, multiple blog layouts, contact page, shop page, site-search option, etc. in the theme. You can use them, easily configure their settings, and create a full-featured blog in no time. Get started with CityLogic today! 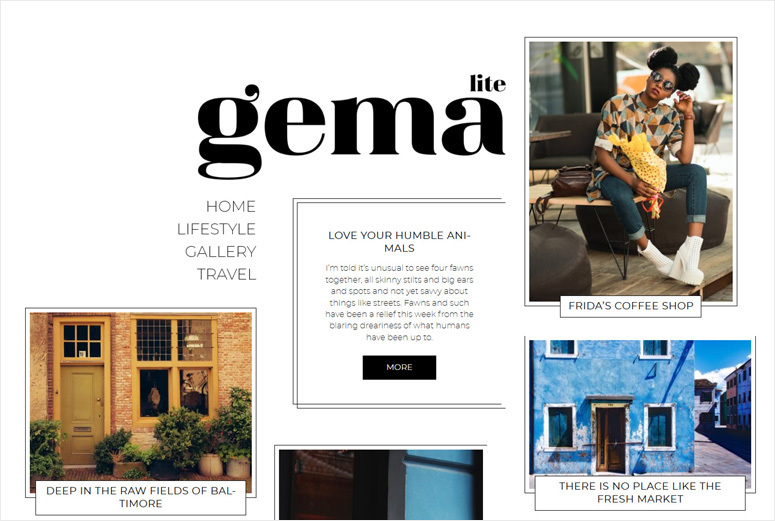 Gema is a stylish and bold WordPress blog theme for creating an exciting travel blog. The theme is best suited for stylish travelers, lifestyle bloggers, photographers, literary dreamers, and other creative individuals. It lets you showcase your WordPress posts in bold masonry style. The theme is simple and easy to use so you can personalize it without writing any code. It has a user-friendly customizer from where you can change your site’s appearance and functionality easily. You can change its colors, fonts, and almost everything else with real-time live previews. The Gema theme is fully responsive and mobile-ready, so it runs smoothly and efficiently on any device and any screen. Get started with Gema today! Travel Way is a fully responsive, feature-rich WordPress theme for travel business sites. It comes with plenty of options to add and showcase different travel destinations or tour packages your travel agency is offering. 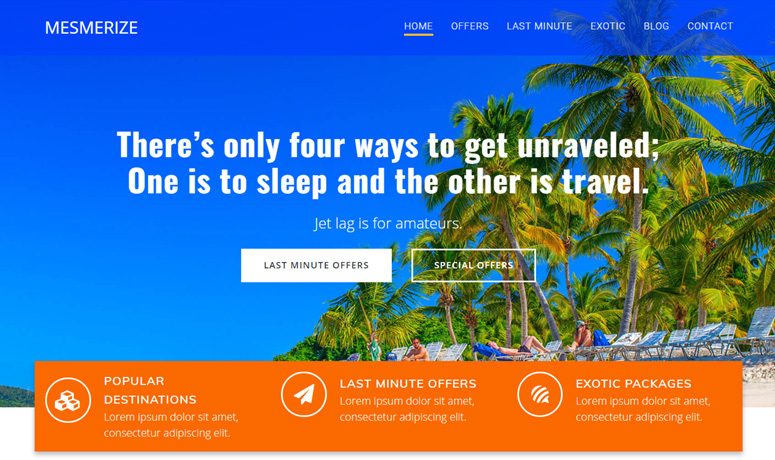 You can present your travel services attractively with this theme. The theme features easy-to-use options for portfolio, services, gallery, blog, testimonials page, team page, booking forms, etc. Plus, it has full support for the WooCommerce plugin so you can easily create a shop page on your site. In addition, it has advanced logo options, custom sidebar areas, layout controls, breadcrumbs, unlimited siders, etc. Travel Way is a perfect theme for creating a complete travel business website. Get started with Travel Way today! Camera is a great theme for passionate photographers. If you love to travel to exciting places around the world and take photographs of the stunning scenery, Camera is the right theme for your blog. 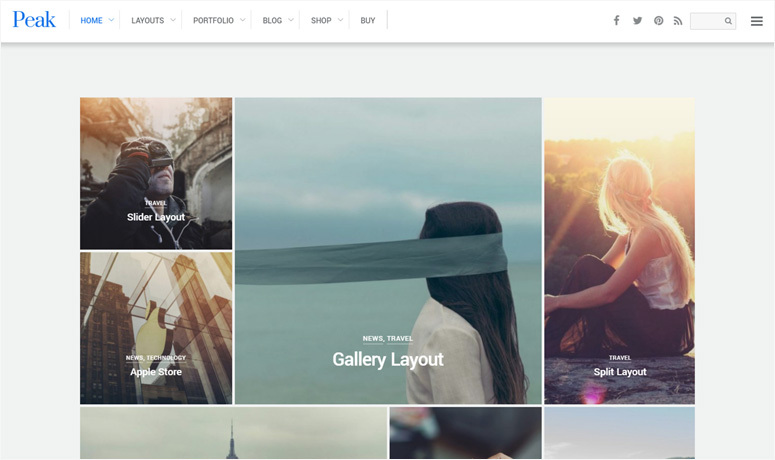 This theme allows you to showcase your photos gracefully and even include stories about them. The theme features a distraction-free, elegant design that highlights your travel photos expertly. You can add a slide-out sidebar for navigation, social links, and multiple widgets so your content is always the main focus. The Camera theme is designed to fit all screens and devices. Also, it’s SEO and speed optimized to ensure your blog’s good presence on search results. Get started with Camera today! Ultra is a highly powerful and flexible multipurpose WordPress theme. 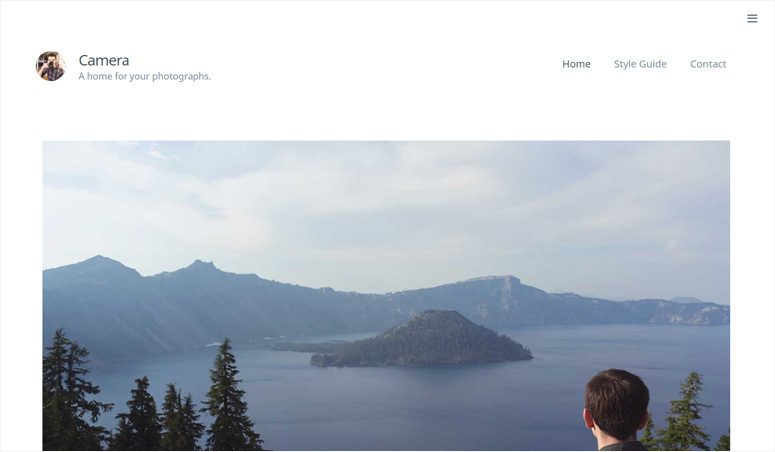 You can use this theme for creating a travel website, travel blog, traveler portfolio, photography site, or an eCommerce site. This theme comes with multiple predesigned demo websites and skins which you can import into WordPress with 1 click and quickstart your new website or blog. Moreover, it offers 60+ predesigned layouts that you can import and use with little customization. Above all, it has the power of popular page builder plugin Themify Builder. Hence, you can create any type of layout easily with its simple drag and drop builder. To let you create a complete travel website, it has options to add Google Maps, pricing table, contact forms, timeline, image gallery, sliders, audio files, a countdown timer, etc. There’re also over 16 header styles, multiple header background options, vast typography choices, customizable colors, and many other useful features. Get started with Ultra today! 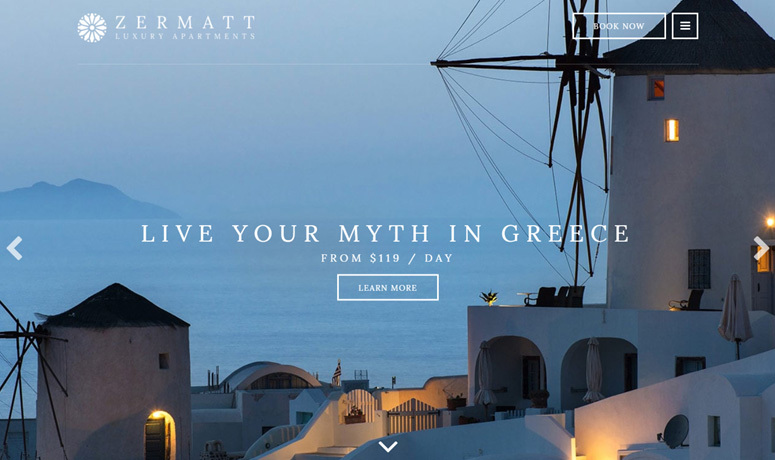 Zermatt is a gorgeous WordPress theme for creating a travel agency, hotel, restaurant, or any other type of business website. It features a drag and drop homepage which you can customize using different custom widgets. It comes with an optional integrated weather module with which you can inform your site’s visitors about the weather in your area (or the area they intend to travel to). The theme has an integrated booking request form to let your visitors book a travel package for their next vacation. Plus, you can add beautiful galleries to showcase your stunning photographs. 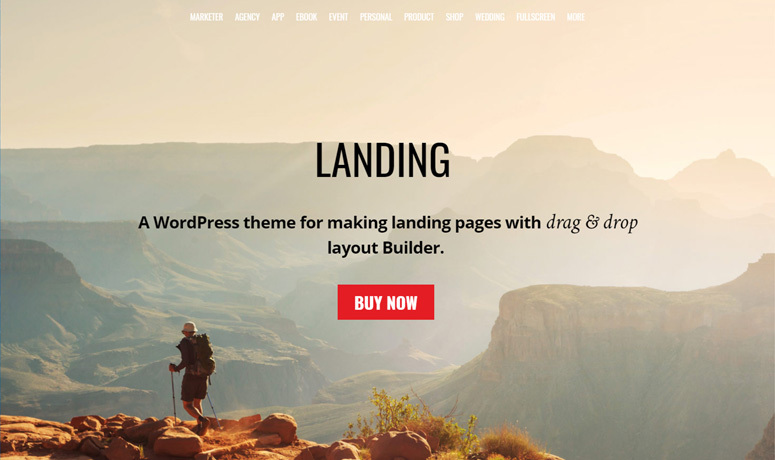 This theme supports popular page builder plugins including Divi Builder, Elementor, and Brizy. You can choose 1 of them and customize your website visually from the frontend. It’s fully responsive and retina-ready. Get started with Zermatt today! 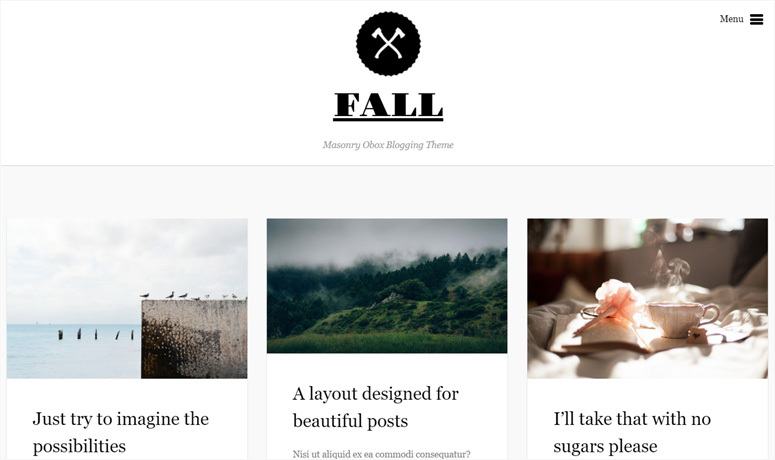 Fall is an elegant masonry-style blogging theme for WordPress. It’s designed to offer a distraction-free reading experience to your users. You can add full-width featured images and showcase your photographs in an attractive manner. Also, you can add images and videos inside your blog posts. The Fall theme has excellent default typography as well as full typography customization options. You can edit font colors, font sizes, weight, line heights, and also use Google Fonts. Similarly, it has other customization options for logo and favicon, backgrounds, colors, and much more. You can customize all the options easily without writing any code. Fall is a 100 percent responsive theme which guarantees an equally great appearance on all devices, including small-screen devices. Get started with Fall today! 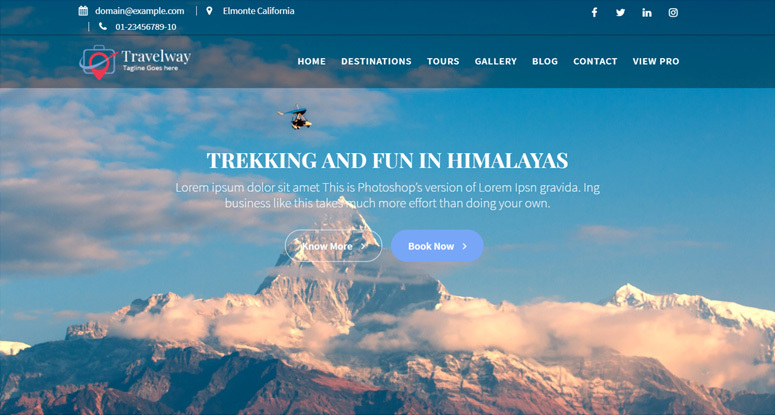 Themify Landing is a responsive WordPress landing page theme useful for creating a travel business landing page or a traveler portfolio site. It has a great design that never fails to impress users coming from your email or social media campaigns. It helps to increase your subscribers, social media followers, and overall traffic to your site. The theme comes with 25+ pre-designed layouts which you can install in WordPress with 1 click and use on your site. Once you install a layout, you can customize it with your own content, and use it as your own. It has Portfolio post type option to display your portfolios in beautiful masonry image layouts. To add your travel business events, it has Event post type option with a Google Maps view of the location. It’s a great theme for creating travel websites. Read our complete Themify Landing review. Get started with Themify Landing today! 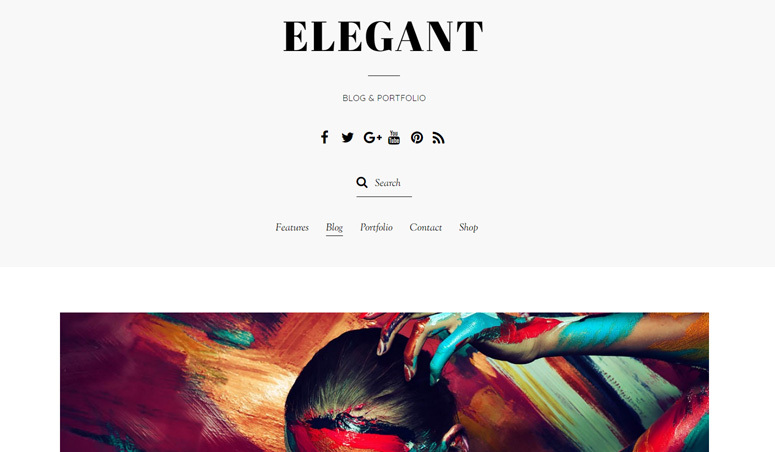 Themify Elegant is, as you would expect, an elegant WordPress theme created by Themify. It’s a minimalist theme with an artistic design that suits creative people including travelers, photographers, painters, and musicians. The theme highlights its cool typography and stunning visual presentation that looks great across all devices. This theme comes with professionally-designed Portfolio and Team post types, new image filter feature, masonry and grid layouts, etc. to allow you add and display your content beautifully. For designing your site, it has an easy to use drag and drop page builder already integrated. You can easily drag and drop the modules and create any type of layout you want. Themify Elegant features 6 alternative color skins which allow you to change the overall look of your site with 1 click. The theme supports the WooCommerce plugin so you can create a shop page easily. Read our complete Themify Elegant review. Get started with Themify Elegant today! OceanWP offers a sea of wonderful features and functionalities that empower you to create any type of website you want. It’s a multipurpose theme you can use for a travel business site, blog, landing page. The theme is compatible with any of the popular WordPress page builder plugins including Beaver Builder, Elementor, SiteOrigin, Divi, and Brizy. Therefore, you can create almost any type of layout you want. It also supports WooCommerce and other major WordPress plugins so you can add any functionality you want, and even create an online store. If you’re a beginner looking for an easy solution, you can install 1 of its creative demos and use on your site. Get started with OceanWP today! Travel Log is a free responsive WordPress travel theme. It has a simple and clean design with the features and functionalities you’ll need for a business site. It has the power of WP Travel plugin to allow you add tour packages, a booking system, payment options, maps, and much more. Thus, the Travel Log theme is suitable for travel agencies, hotels, tour operators, or anyone offering travel services. The Travel Log theme is user-friendly and easy to customize. It has a built-in WordPress Live Customizer to let you personalize the appearance of your website and edit functions with real-time live previews. Get started with Travel Log today! 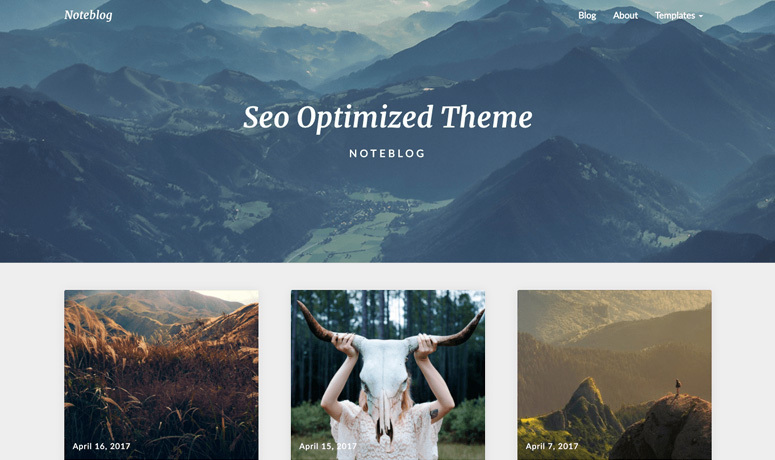 Noteblog is a simple, free WordPress blog theme great for creating a travel or personal blog. It has a grid-style blog layout to showcase your articles and photographs. It’s an SEO optimized theme which makes your blog get better visibility and ranking in search results. This theme lets you add Google AdSense as well as affiliate links to your blog to earn referral income. Its pleasant typography and reader-friendly design are perfect for keeping your readers engaged and happy. Moreover, it has custom widgets, header image, logo and favicon options, etc. to make your blog look unique. It’s a fully responsive theme so that your blog will load smoothly on all devices. Get started with Noteblog today! 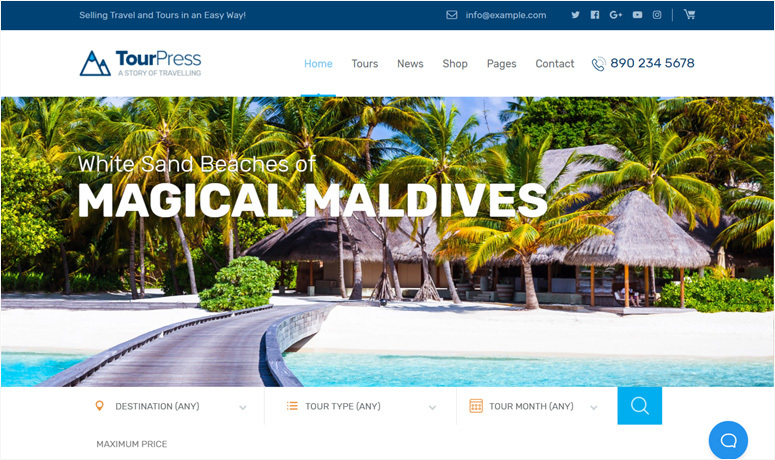 TourPress is a premium WordPress travel theme suitable for travel businesses, like travel agencies. This theme allows you to present all the important information about your business and everything your users need to know in a sophisticated way. The TourPress theme has easy options to create travel packages for your potential customers, add tour booking forms, and add tour search functionality based on destination, type, month, and price. You can show the tour packages in a list, grid, gallery, or other styles. Plus, it has a stylish blog layout to share your travel success stories. 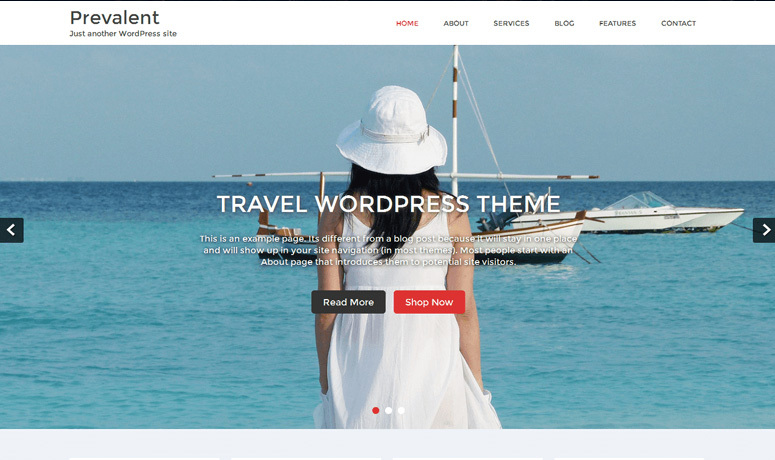 This theme includes a 1-click demo import so you can install the theme demo in WordPress and quickstart your travel website. Get started with TourPress today! 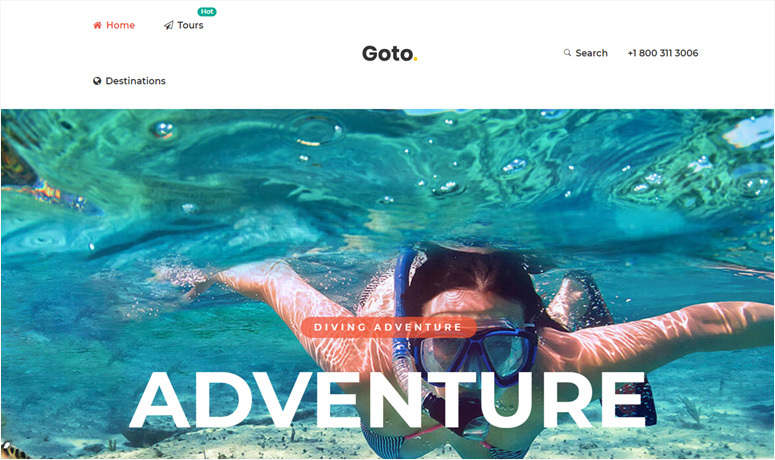 Goto is a feature-rich tour and travel WordPress theme you can use to create your travel website. It comes with a wide range of powerful features and functionalities. It has an in-built tour booking option that lets you add a booking form on your website homepage to make booking easy for your users. There’re 3 unique predefined homepages and multiple layouts for inner pages. It has beautiful designs for tour lists, tour grids, tour singles, destinations, contact pages, and a blog. In addition, it also has a tour review system to let your customers rate the tour they recently completed. This feature helps your potential customers choose the best tour. Get started with Goto today! 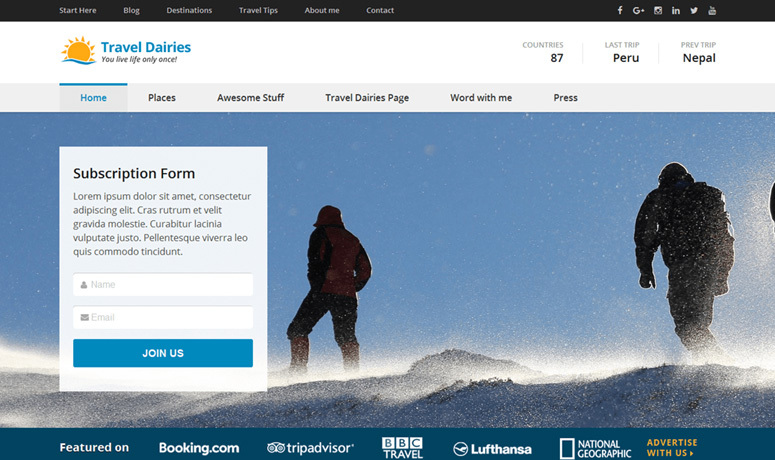 Wanderers is an adventurous theme for travel and tourism websites. The theme has an aesthetically beautiful design that’s sure to impress online wanderers looking for exciting travel destinations to explore. It has a full set of features to let you create a full-featured travel business site. It allows you to add stunning image and video sliders with an intriguing message to invite users to join a tour. It has in-built booking functionality, PayPal integration to accept payments, custom post types for destinations and tours, and several other useful features. Plus, there’re shortcodes for tour lists, a tour image carousel, tours filter, clients carousel, etc. Wanderers is 1-click demo import ready theme so you can import the theme demo content with literally 1 click, customize it with your own content, and publish your site. Get started with Wanderers today! Grand Tour is a wonderful WordPress theme for making a grand tour and travel website. It’s one of the best-selling travel themes in the ThemeForest theme marketplace. It has a marvelous and conversion-optimized design to convert more users into customers. The theme allows you to add detailed tour destinations, an elegant tour gallery, tour video previews, various booking options, various payment options, coupon codes and discounts, tour search, etc. All these options will help you to create a complete tour and travel website. The theme comes with several pre-built demo websites which you can import into WordPress with 1 click, customize, and get your website ready in a snap. Get started with Grand Tour today! 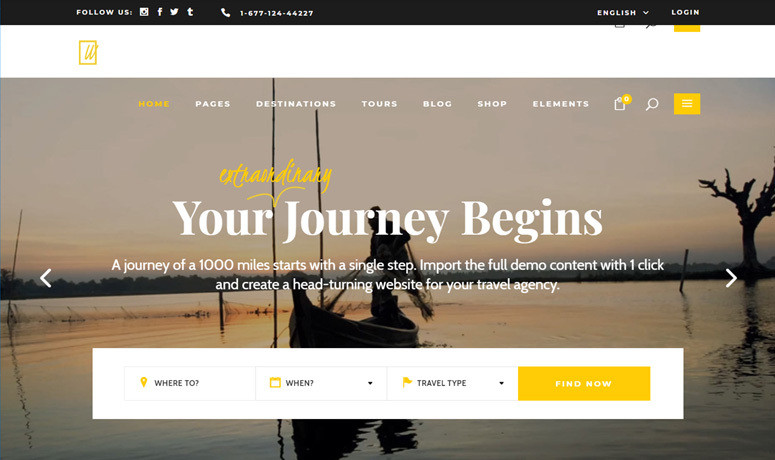 Travel Diaries is a free responsive WordPress theme suitable for travel bloggers. It allows you to beautifully present your travel diaries to people and inspire them. It features a custom homepage design with an email subscription form, recent posts, most popular posts, and a featured section to add logos and a call-to-action message. This theme features a custom logo option, footer widget area, 4 custom widgets, child theme support, sidebar options, and much more to let you customize your site. You can easily integrate social media networks and enable social sharing. The Travel Diaries theme is SEO and speed optimized to let your blog rank better on search results and improve user experience. Get started with Travel Diaries today! 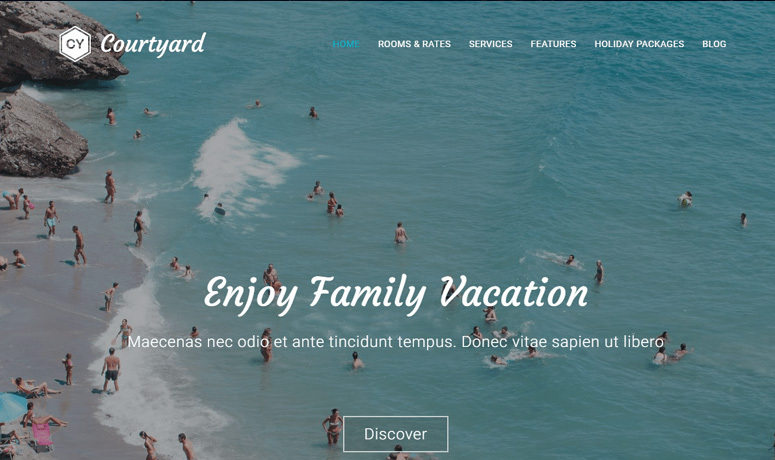 Courtyard is yet another free WordPress theme designed for small service-related businesses like a hotel, travel agency, or tour company. It has a hero slider with booking options to allow users to book a hotel and start their vacation. With its built-in Packages widget, you can show your 5 most recent tour packages in a grid with different background styles. Similarly, it also has a Testimonials widget to display what your customers are saying about your services. The image gallery widget lets you showcase the most fascinating photographs from your travel destinations to impress your future customers. This theme is compatible with WooCommerce so you can easily add a shop page and enable eCommerce transactions. Get started with Courtyard today! Prevalent is a professional WordPress travel theme with plenty of features and functionalities to create a travel website. Designed with travel and tourism entrepreneurs in mind, it has a clean and elegant design. The Prevalent theme allows you to showcase your best travel destinations, special offers, latest news, client testimonials, photo galleries, and everything else you’ll need on a travel website. You can customize each of these sections effortlessly from the theme customizer. This theme is fully responsive and retina-ready. Therefore, your travel website will look great on all types of devices and screens. Get started with Prevalent today! Mesmerize is a highly flexible multipurpose theme that you can use for any type of website including a travel agency site, blog, restaurant, mobile app, or eCommerce site. It comes with a powerful live editor that allows you to edit text, images, colors, add elements, and customize your page layout completely with real-time live previews. As its name implies, Mesmerize offers a truly mesmerizing website-making experience. There’re multiple ready-to-use theme demos and 100+ predesigned blocks you can use to build beautiful pages in no time. With Mesmerize, you can use Font Awesome icons, Google Fonts, Google Maps, photo galleries, and much more. It’s a great theme that’s well worth trying out for your new travel website. Get started with Mesmerize today! 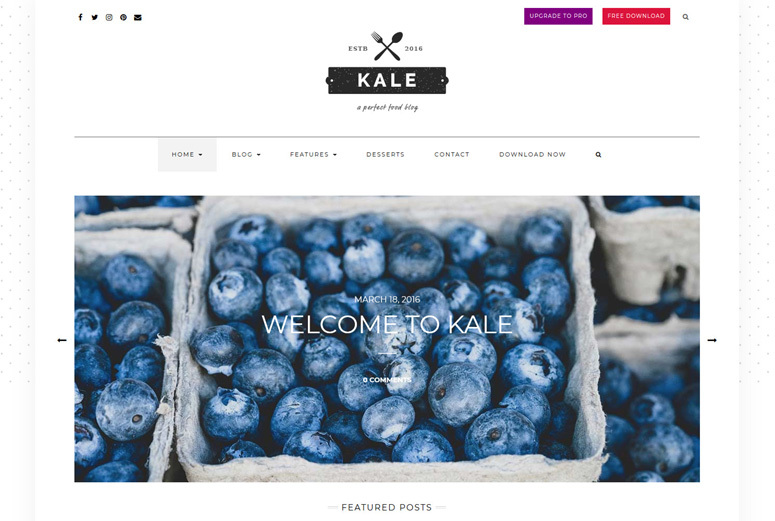 Kale is a simple and elegant WordPress blog theme that can be used for creating travel, food, fashion, and personal blogs. It features a simple and clutter-free design that looks pleasant to the users’ eyes. It’s an SEO optimized theme so your blog content will get better ranking in search results. You can use a text or image logo in your blog, select a background color or add a background image, add multiple sidebars, social media menus, and more. It allows you to add front page featured posts and front page highlight post to focus on your most interesting travel stories and travel photographs. The Kale theme is fully responsive so your blog will look great on all devices regardless of screen size and resolution. It’s a great theme for your travel blog. Get started with Kale today! We hope this article helped you to find the best WordPress themes for travel blogs. You may also want to see our handpicked list of the best WordPress real estate themes. I have found one very good WordPress theme for blogging named Bloggers lite. It comes with fully responsive design, live customizer, left-right sidebar, unlimited color options.